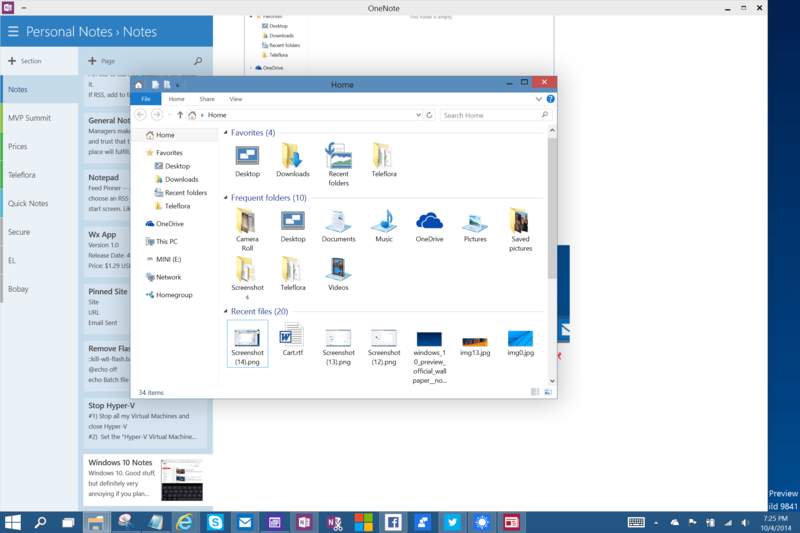 A look at what I’ve noticed in Windows 10. These observations are for build 9841, which became generally available on October 1, 2014. Since there is still a year or more before release, most if not all of all observations are not a representation of the final product and are either going to be adjusted or outright replaced in later builds. So while you can get a good idea of how Windows 10 looks and feels today, many of those experiences will not be with what you’ll see Windows 10 when it debuts in a year. As a product very much in development, there are many features missing and incomplete, some even in older states of development than the released versions available publicly, such as OneDrive. You’ll observe the notification icon on the taskbar does not have the enhanced info tip and progress bar that came to Windows 8.1. The overall theme here is that touch has been shattered in the re-construction of Windows. The Continuum design concept that flips to touch-optimized interface depending on your hardware will be interesting to see. 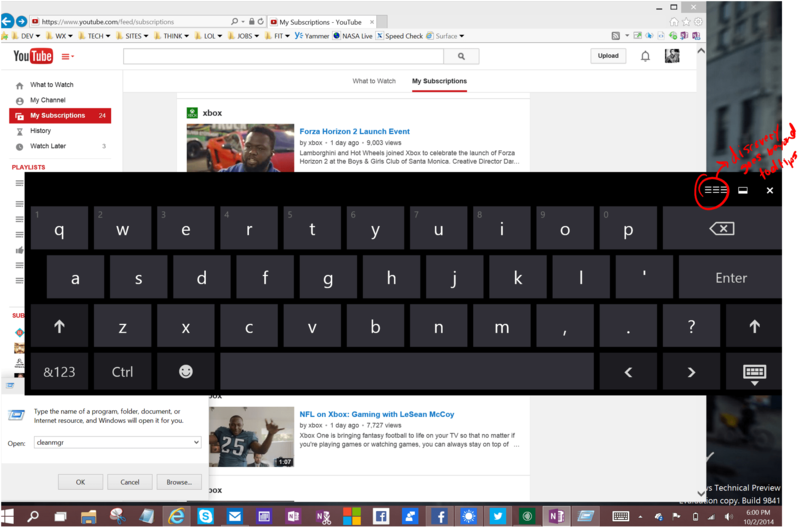 For example, will my Surface allow a finger-friendly view when I fold the keyboard to the back? We’ll find out as the new builds are released. Some UI changes are more cosmetic but still result in some usability problems. After decades of ever-increasing window border sizes – to the point of Windows XP looking like a Fisher Price playset – the borders in Windows 10 are a single pixel line. While these minimalist window edges appear modern and light, they can be a little harder to target with the pointer to resize a window, and have odd inconsistent behaviors to boot. The vertical resize is “inside” the window title bar, but the horizontal resize handles lie outside the window client area (blank space, like Office 2013 — which is even harder to find). In Office 2013, the resize handle lies outside the edge of the window, and this holds true everywhere on Windows 10 so far. While grabbing a window edge is less than intuitive, the gap doesn’t cause enough of an issue to make resizing a difficult task, and it is easier with touch where the UI gracefully compensates for the crude pointing device of our fingers and attaches to the window edge even if you miss the mark. This extra finger buffer can be seen when the snipping tool attempts to capture a window, your screenshot will include more than the window in the horizontal plane. I initially thought this gap was due to the drop shadow, but the shadow actually extends quite a bit further. Notably these gaps do not get included if you use Alt-PrintScreen to capture the window area (or Windows+Fn+Alt+Space on a Surface). The snipping tool grabbed more than the window, presumably because of the hidden window resize handles. Another odd gap is in taskbar icons, particularly when one is running in another desktop. Here, IE has a wide gap because of space reserved for the “multiple windows” indicator, which isn’t visible on this desktop. This gap on the right is to accommodate an invisible UI element on another desktop. Intentional gap in notification icons. Intentional visual tweaks include greater spacing for notification area icons, and a visual “grab” indication that the on-screen keyboard can be moved. No more feeling trapped and held hostage when you need to get to the Run box behind the keyboard. Grab handle makes the keyboard movement more discoverable instead of an accident. Window management in the desktop has some new bugs as well. A popular Windows 7 feature, Aero Snap, no longer remembers window sizes in Windows 10. If you snap a window to the side and later move it back, it does not return to the original size/shape. This means every window you snap is guaranteed to become the height of the screen thereafter, leaving it difficult to resize vertically. Initially it appears that title bars and the taskbar are forever locked in view, but you can place a universal (Store) app in full-screen to enjoy a Netflix show without taskbar and title bar. But it loses this full-screen attribute if you ever alt-tab to another app and back. Like nearly everything else in this post, this is even more annoying on a tablet. In other ways, snap is being improved. They preview of a snap is now far more visible and new corner snaps provide faster ways to compare data. + Tab invokes a desktop switching UI, but you cannot “tab” to the next desktop from this view, so using it from the keyboard is ruled out. Multiple desktops might benefit from the behavior of multiple monitors, where each monitor’s taskbar only showed apps currently running on that monitor. Seems logical to bring this behavior to the desktop switching tool as well. With a year or more until release, it’s safe to say this experience will evolve several times. If you’re curious how aero snap, shake, twist, and shout all came about, you can read about the work that went in to the Windows 7 aero window management gestures on the Engineering Windows 7 blog, which offers a great example of the telemetry and testing that takes place and the scope of iteration in a feature like this. Notifications in the notification area of the taskbar are redirected and displayed as Windows 8.1 style banner notifications. For me these displayed at the top right of the screen as before, but some users see these show near the clock at the bottom right. For these and other cases, you’ll receive a request to answer a survey question. Even more than Windows 7, Windows 10 is being designed by majority opinion pretty much from the start. In the File Explorer, the Share charm can be invoked from the Share toolbar. Previously nothing on the desktop could pass details to the Share charm (that was a “tile world” function). Also notable is the Mail app has gained the ability to receive a file shared from the desktop as an email attachment in composing a new message. The legacy right-click/send to email still launches your desktop based MAPI compatible email client like Office Outlook, Live Mail, or Thunderbird. The taskbar gains a shortcut for the desktop switching, making it slight more tuned for mouse or touch than keyboard junkies. 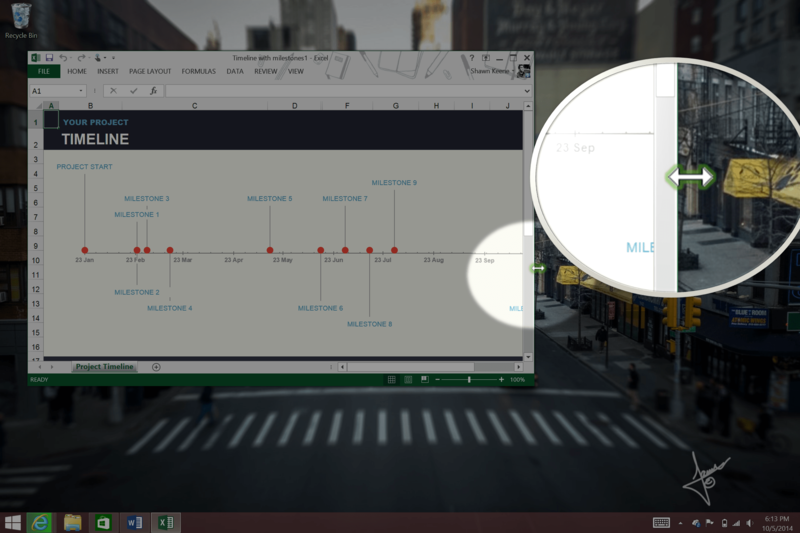 The taskbar also gains a search button that appears to be identical to Start menu search, but without the Start menu and trending ads instead – all in a plain white box with no theme or controls. I don’t see the point of this extra search button at all and wish I could remove it. + Q, W, S, and F) have all been disabled. Search must start only from the new search button or the Start menu or search charm. Keyboard shortcuts aside, the search charm still has the ability to filter results by type. The new home location in File Explorer is very welcome. No more digging for the directory where a file was when you need to upload a file. All your recent files are here in order. Going beyond short feedback when you trigger different interactions, Microsoft is really pushing the majority opinion into view. When you submit feedback, you’ll be presented with feedback from previous users and an option to “me too” the vote. Submitting feedback and your bug is important, but I also encourage everyone to browse the feedback topics and “me too” the ones you like. Pooling votes will do more good than saying the same thing 300 pages later. If you are using a desktop workstation you may never notice the lacking touch functions and enjoy the return of the standard desktop. For the moment, this update is downright hostile to tablet users, especially for all but blocking the app commands. I had initially planned to use Windows 10 on my Surface Pro 3, but it’s far from ready to be used daily. For now, I’ve restored my Windows 8.1 and will test Windows 10 from a Windows To Go USB stick. Let me know in the comments of I missed anything or what your thoughts are. Will you be using Windows 10 or waiting for later builds become available? 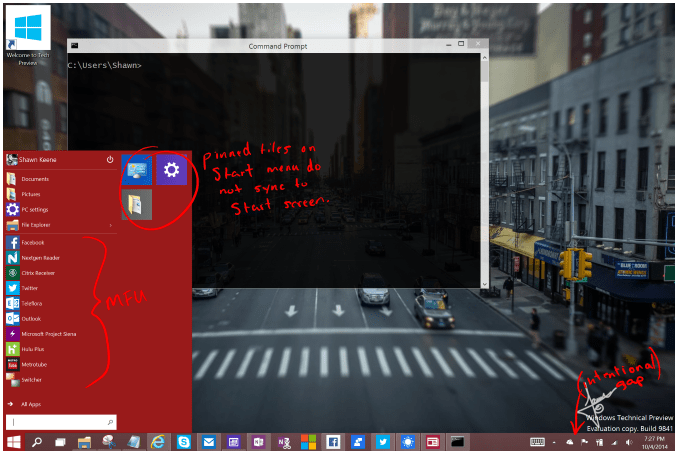 For further reading about how we got here, check out From Windows 1 to Windows 10.